This is how Andrew McCutchen watched at least one of the MLB playoff games at home on television last fall: He stood up, assumed his batting stance, and timed his swing to the pitches as he saw them on the screen. McCutchen later shared this story with his agent, Steve Hammond, who could only laugh. "I was like, 'Are you kidding me?'" Hammond told me over the phone last week. "He couldn't get back quick enough. And I think the next-best thing, closest to being out there, was to sort of stand up and watch and work on things." This was what it meant to be a Pittsburgh Pirate less than a year ago: a real-life major leaguer, stuck dreaming about the playoffs like a kid with a Wiffle bat in the basement. McCutchen had made his first All-Star Game appearance last season, but he had a rotten second half, hitting .216/.330/.392 after going .291/.390/.505 in the first half. His production pretty much mirrored that of the Pirates, who were 53-47 and in first place on July 19, only to go 19-43 the rest of the way. In March, though, the Pirates put their trust in that first half, inking McCutchen to a six-year, $51.5 million contract extension. It was a sharp move, making a commitment to a promising young centerfielder while he was securely under franchise control, so he could be the fulcrum of the team for the foreseeable future. It was the kind of move the Pirates haven't often made in the 20 years since their last winning season. But now, McCutchen isn't just a good player for the Pirates to have. He's the best hitter in the National League—a skinny guy with power; a power guy with speed. He leads the league in offensive WAR (5.8), batting average (.373), slugging percentage (.642), on-base-plus slugging (1.071), total bases (222), and several other advanced categories. Even those numbers don't really do his season justice. On May 5, just after he had missed a couple of games because of a stomach flu, McCutchen was hitting a perfectly fine .298/.356/.383, with no homers. By June 17, those numbers were .325/.382/.541, with 11 homers. And in the 24 games after that, right up through last Tuesday, McCutchen's stats were an insane .490/.533/.929, with another 11 home runs. Entering this season, according to Baseball Prospectus, McCutchen had eight career home runs to the opposite field. This season, he had already hit that many the other way by July 15. And here we are on July 24, and the Pirates are again flirting with contention; they're 13 games over .500, and just one-and-a-half games behind the Reds for first place. "I would lie if I said it didn't help a little bit, getting the contract," McCutchen said in a phone interview last Tuesday. He was in Denver, and the conversation took place just hours before he launched a 442-foot homer (see the video below) that was reminiscent of the shots that used to fly out of Coors Field during the turn-of-the-century home run binge, before the humidor. "It did help me a lot to know that I'm going to be here for the next six years or more. It definitely helped me to relax and just play the game of ball and not have to worry about anything. There's no pressure. It's just going out and performing." You have to go back an entire generation to find a homegrown Pirate who did anything close to what McCutchen is doing now. It's still easy to forget that Barry Bonds ever played in Pittsburgh. You think of him as that hulking, sulking Giant hitting bombs deep into San Francisco's golden hour. In 1986, though, when the Pirates called him up a year after drafting him sixth overall out of Arizona State, Bonds—a skinny guy with power; a power guy with speed—arrived in Pittsburgh promising the same kind of deliverance that McCutchen offers now. It was a hopeless time for the franchise. After the swinging successes of the '70s—six division titles, two World Series championships—the Pirates by the mid-'80s had been hollowed out completely. In '85, the Pittsburgh drug trials were in full swing, and there were rumors the team might move to Denver. I remember George Hendrick hobbling around aimlessly in right field. I remember John Candelaria, a mainstay in the rotation for 10 years, getting traded to the Angels. The Pirates lost 104 games. Chuck Tanner got fired. Everything sucked. Bonds's arrival in Pittsburgh in '86 coincided with Jim Leyland's first season as the manager. That team lost 98 games. Bonds hit .223/.330/.416, with 16 homers. He also stole 36 bases and started 77 games as the team's leadoff hitter, which should tell you how long ago this was. Bonds's time was coming, and his trajectory would briefly align with the franchise's. By 1990, Bonds was the NL MVP, and the Pirates were in the playoffs, the first of what would be three consecutive division titles. But the window was closing. The Pirates held Bonds's arbitration rights in 1990 and '91, and in '92 they signed him to a one-year deal for $4.7 million, the highest single-year contract in history at the time, which should also tell you how long ago this was. But it was widely assumed that Bonds would blow town once that contract was up, which is exactly what happened. He won his second MVP in '92, but that season ended with the ninth-inning nightmare of Game 7 of the NLCS, with Sid Bream sliding into home. As you probably know, the Pirates haven't managed a .500 season since, and Bonds's shadow has hung over all the grim proceedings. His throw to the plate, coupled with the fact that he hit just .191/.338/.262 with only one home run in his three playoff series with the Pirates, guaranteed that he'd be scapegoated for all eternity by the team's fans. But what his departure exposed was an organizational failure that continued into the new century. The Pirates couldn't identify talent, and they couldn't develop what talent they had. Pittsburgh was the place you left to make your career. That's what McCutchen means to Pittsburgh. He's a living rebuke to all the incompetence of the past two decades—talent identified, talent developed, talent retained. His handling has been a smart exercise in Bonds-proofing, from the moment he was drafted, through the gaming of his arbitration clock, to the signing of his extension. The Pirates' timing was impeccable. His pace through Sunday—.372 average, 38 home runs, 114 RBIs—has been accomplished over a full season by just six other players in history, according to ESPN. Imagine what might have happened had the Pirates and McCutchen not reached an agreement on a long-term deal during the offseason. Hammond, for one, suggested the Bucs might have been in a difficult spot if McCutchen were to continue hitting at anything close to his current pace. "There's a good chance that there's no way Pittsburgh could have signed him," Hammond said. "He would have gone into another stratosphere with this kind of performance. But there's no need to speculate on that because that's not even going to be an option." Actually, the Pirates would have signed McCutchen no matter what, since he was eligible for arbitration after this season. But with what he's doing, McCutchen might have been able to command Matt Kemp-type money. Maybe the Pirates would have been forced eventually to trade him. Maybe not. As Hammond said, it doesn't matter at this point. The Pirates have themselves a burgeoning star at a price that's a relative bargain. And the deal is backloaded, with McCutchen due $13 million in 2016 and $14 million in 2017, plus a team option of $14.75 million in 2018, by which time annual salaries for the game's top players might be double that amount. Look at McCutchen's numbers again. Now consider: He bats in the No. 3 hole. Directly behind him, the Pirates' cleanup hitters are batting a combined .240/.289/.390, with just 12 home runs. It's a wonder McCutchen sees any pitches at all. 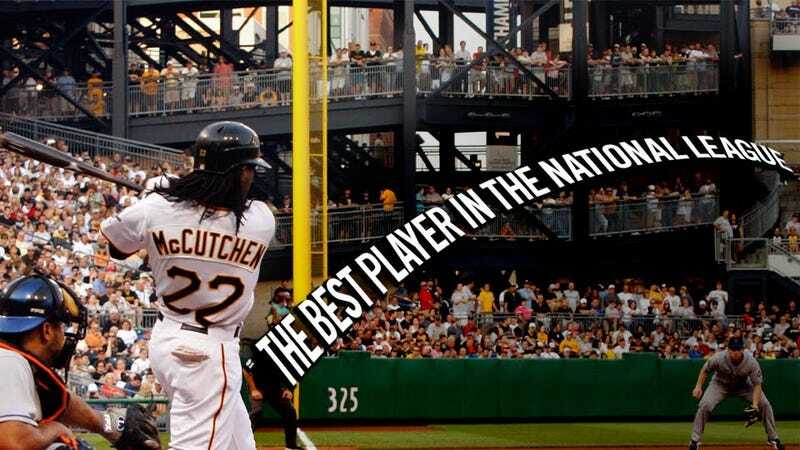 The Pirates drafted McCutchen out of Fort Meade (Fla.) High School with the 11th overall pick in 2005. Justin Upton, Ryan Braun, and Troy Tulowitzki were among those drafted ahead of him. Jay Bruce, Jacoby Ellsbury, and Matt Garza were among those chosen in the first round behind him. McCutchen was coming off a senior season in which he'd batted better than .700. But there were concerns about his size; his listed weight is a generous 185 pounds. "They were going to draft me for a reason, and the reason was because they see potential in me, and it didn't have anything to do with my size," he said. "I had heard a little bit about it, but I didn't care that much to where it bothered me because there was nothing that I could really do about that." Most players drafted out of high school are accustomed to being dominant at every level they've played. As a professional, McCutchen had to accept the transition from knowing he could hit .700 to aspiring to hit .300. He made a natural progression through the Pirates' system, but not without having to learn that the game requires an approach that's as much mental as it is physical. "I was just so stuck on results in the minors," he said. "That's something I had to kind of get over." I saw him before the game and was incredulous; he's listed as 5'10", but there's no chance he's that tall. I couldn't believe that this prospect that'd I'd invested so much time and hope in was this short, skinny little guy. In the first inning, he stepped into the box against David Price and his hands flashed through the zone and he crushed a flyout to deep left center field and immediately the light bulb went on in my head. I'm not a scout and I'm not good at identifying the difference between minor league talent and Major League talent, but in one swing it was immediately apparent to me that McCutchen had something special. I never wondered about him again. McCutchen is indeed gifted with tremendous bat speed. Jeff Branson, who managed him at Single-A Hickory (N.C.) in 2006, told me McCutchen's hands are "as quick as anybody I've ever seen." But Branson also noticed something else at the time: When he swung, McCutchen relied almost exclusively on that bat speed. "He was kind of an upright guy, and he just didn't use his lower hand to be able to have that extra drive," said Branson, who is now the hitting coach for the Pirates' Triple-A affiliate in Indianapolis. "He's always had raw power, but in order to consistently drive the ball out of the ballpark in all parts of the field, we just made an adjustment of kind of lowering him, getting him into his legs a little bit. It gave him that extra strength." McCutchen hit just two home runs in 58 rookie-league and low-A games in 2005. But he began the following season with Hickory, where Branson got to work with him. McCutchen wound up being promoted to Double-A before the season was over. And he finished the season with 17 homers. He was on his way. McCutchen described Branson's instruction as something of a breakthrough. "We always say to look at it as if you're trying to punch something," McCutchen said. "When you want to punch something with a lot of authority, you don't just jab. When you really rear back to hit something, the first thing you're using is your legs; you're using your legs to generate that power. "The first swing I took was a ball that, coming up until that time, I've never hit a ball that far in my life. [Branson] said, 'See? That's where you generate your power. Now you don't even have to swing as hard.' That was definitely the first step of very many others from there." Obviously, no one could predict McCutchen was going to be this good as he progressed through the minors. What McCutchen had, according to Branson, was an ability to put the barrel of the bat on the ball with consistency, along with extraordinary athleticism. But there was something else: McCutchen was not only willing to listen to instruction, but able to apply what he had learned the instant he stepped back into a game. "He's just one of them natural-born, gifted guys, that if he feels it once, he's got it," Branson said. He made it to Pittsburgh in June 2009. The year before, the Pirates had drafted Pedro Alvarez, a Scott Boras client, and paid him above slot to get him signed. After years of paying lip service to the concept, the franchise finally seemed to be doing what was necessary for a small-market club to build a winner. But to make room for McCutchen, the Bucs traded Nate McLouth, an All-Star in 2008 who had signed a three-year contract extension just before the '09 season began. To a lot of fans, the McLouth trade reinforced a belief that the Pirates were still serving as a de facto farm team for bigger-market clubs. He didn't miss a beat; in his first 108 games with the Pirates he had a three-homer game and hit a dramatic walkoff off of Brad Lidge that resulted in an iconic celebration that no one that watched will ever forget. Through 2011 and 2012, various aspects of his game improved bit by bit. His power grew, his patience grew, he learned how to use his speed to his advantage in the field. Before 2012 started, you could point out all of the disparate parts of his game that have improved since his debut in 2009, even if his numbers every year seemed to be static. Those swings McCutchen took while watching the playoffs on TV were just an indication of how eager he was to shake off what had happened in the second half last season. Before spring training, McCutchen spent several weeks at the IMG Academy in Bradenton, Fla., primarily doing strength and speed work. Ken Bolek, a former minor-league manager with the Cubs, Indians, and Astros, serves as IMG's director of baseball. The academy has worked with numerous major leaguers in its 18-year existence, but Bolek put McCutchen in a category with Nomar Garciaparra and Joey Votto—remarkably talented guys Bolek said had approached their time at the academy with an enthusiasm that set them apart. "You can feel the seriousness of how certain guys go about their work habits," Bolek said. "You can sense that in casual conversation, but when he was involved in a drill, you could see a light switch go on." McCutchen knows a lot of people expect the bottom to fall out again, but that's also exactly what he's been working to prevent. He returned from the All-Star break and homered in four of his first five games, quelling any initial speculation about what's in store for his second half. The Pirates, for their part, won three of six on their road trip upon coming back before sweeping the Marlins over the weekend. Even with last night's loss to the Cubs, their 32-15 record at home is the best in the majors. There's still a long way to go, but it's a start. "Everybody's waiting for the dreadful second half of the Pirates," McCutchen said. "We've just got continue to just doing what we've been doing the first half. If we have a couple bad games, it's all right—we've just got to get ready for the next one, like we've been doing all year."